Dear guests and friends of Surf House Peniche. It is with great pleasure to inform you that from 2018 we open our doors in more cosy and comfortable property in the heart of Baleal, Peniche. The new location is close to the amazing surf spots and on top of that you will have access to our new swimming pool and a tennis court. Our new rooms have a terrace and some rooms are with an ocean view. Besides that, our new space allow us to start serving a breakfast. We will continue to offer the friendly service and organize surf camps for you at the new address. Please, join our new house the Surf House Baleal. Surf accommodation for everybody in the paradise of surfing. No matter if you are a single traveller, a couple, a group of friends or family, the Surf House Peniche offers variety of accommodation in Peniche for all ocean lovers. Stay in a cool SurfHouse right next to the beach and enjoy your dreamlike surf holidays in Portugal. Choose from a hostel kind of accommodation double rooms or a private apartment. All in the best location in Peniche Baleal. The Baleal beach is just few steps away from the accommodation for surfers, very close to the line-up. The real spirit of Portuguese surfing is everywhere around the Surf House Peniche. Moreover, the neighborhood of the surf house provides great surf and beach bars, clubs, surf camps, restaurants with stylish atmosphere and Portuguese cafes. There are various surf spots around the Surf House Peniche like Baía de Baleal and Cantinho da Baía. Favourite beaches Prainha and Lagido are also in a short walk distance. 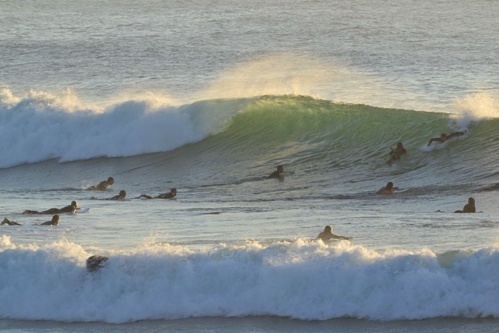 Other surf spots like Molhe Leste and famous Supertubos are in short distance by car. Do you want to know more about surfing in Peniche? Check the free Peniche surf guide. Be sure to visit the original Surf House Peniche to experience the best surfing time in Peniche Portugal. The Surf House Peniche is very well located in the heart of Baleal Peniche. Our surf school in Peniche offers surf lessons with qualified surf instructors, 7 days Peniche surf camp or individual Peniche surf rental. Make your online reservation of Surf House Baleal in Peniche today.